Now that you’ve seen just how easy and fun my How to Make Doll Clothes Online Sewing Tutorials are, you’d have to admit, it’s the easiest possible way to learn. Stop wasting time on frustrating techniques that could be done a better way. Think of how enjoyable and fulfilling it will be to learn dozens of doll clothes sewing techniques that you can then teach to your little girl. Or, why not let me teach your little girl how to sew doll clothes; imagine how proud she will be when she makes them herself. Want to read more in depth reviews? The following links will take you to real live blogs where you can read what others have written about my How to Make Doll Clothes video course. Do you hate paying ridiculous prices for doll clothes but think: “it’s too hard” or “I’ll never be able to make it myself”? Well you can change that right now. 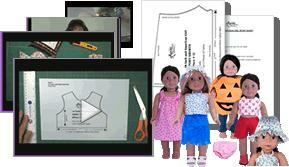 For the incredibly low price of just USD$37.00 you will get LIFETIME access to over 130 video sewing tutorials. PLUS, you’ll receive 8 FREE 18 Inch American Girl doll clothes patterns as an EXTRA SPECIAL BONUS!! These patterns alone are valued at USD$46.50 and they’ll be yours FREE!! 27 cents per video? That’s incredible! I want you to be thoroughly delighted with my online sewing tutorials. The video above is just like the more than one hundred and thirty you’ll receive. At USD$37.00 for the entire program, that’s a teeny tiny 27 cents per video! You’ll get LIFETIME access to the videos tutorials so you can come back time and time again. I’ve spent a great deal of time putting each one together so that you can see exactly how to do what I’m doing. I know you’ll realize the incredible value when you see how well produced the videos are. Considering the value, the quality and the sheer number of top tips for sewing doll clothes, I’m 100% confident that you will absolutely love LIFETIME access to my video sewing tutorials! Start now!! Join me in a new level of sewing enjoyment and fun! !